What price victory? The war with the Republic of Haven has resumed . . . disastrously for the Star Kingdom of Manticore. Admiral Lady Dame Honor Harrington, Steadholder and Duchess Harrington, the single victorious Allied commander of the opening phase of the new war, has been recalled from the Sidemore System to command Eighth Fleet. Everyone knows Eighth Fleet is the Alliance's primary offensive command, which makes it the natural assignment for the woman the media calls "the Salamander." I am a big David Weber fan, but have only read his books so far. This was the first audible one from him. The story dragged on too long with too many unimportant details and the narrator was terrible in her voices. 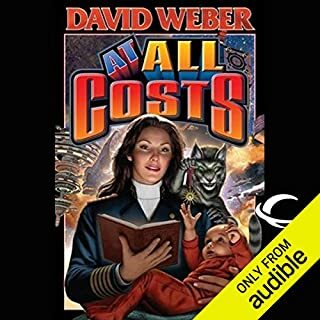 I have over 63 audio books and this was one of the very few books I could not finish to the end. I will try to pick up a copy of the book to read but in no way can I think about listening to this again. Be warned. I am a huge fan of Stephen King and have read just about everything he has written. 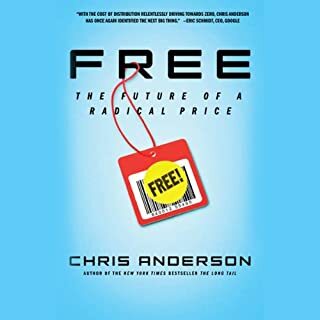 I was afraid that the book would not translate well into audio but it was GREAT. Although I could see some of the plot development a little early, it was really well done and I anticipated the development as opposed to saying "oh, now this is going to happen". Also, there were times the story was going along and it did NOT go in the direction you thought. 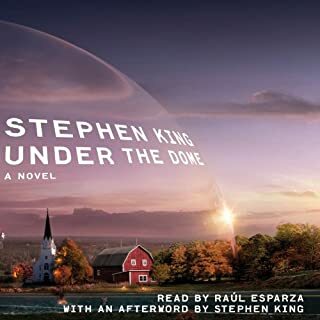 Kudos to Raul Esparza as the reader as he does a wonderful job with not only the voices but the tones and inflections as well. Each personality is given their own distinguishible voice in the story. 5 stars book, 5 stars narration. Tavi of Calderon, now recognized as Princeps Gaius Octavian and heir to the crown, has achieved a fragile alliance with Alera's oldest foes, the savage Canim. But when Tavi and his legions guide the Canim safely to their lands, his worst fears are realized. The dreaded Vord - the enemy of Aleran and Cane alike - have spent the last three years laying waste to the Canim homeland. And when the Alerans are cut off from their ships, they find themselves with no choice but to fight shoulder to shoulder if they are to survive. Book 5 is just flat out great. It is a book about fighting, not fighting, magic, humanity, strength, love, trust, betrayal and standing up to do the right thing even when it costs you to do it. Kate Reading is superb as always in this series. The Vord remind me of the Borg (Star Trek) in their single mindedness. Maybe any enemy that has a 4 letter name with OR in it is supposed to have the same personality traits...lol. Do yourself a favor and enjoy this book, it really is an adventure for the mind. Enjoy! 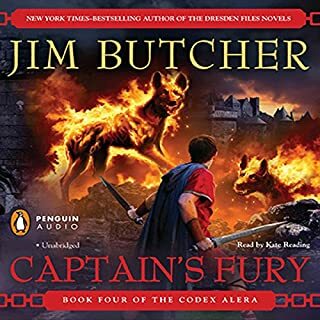 In his acclaimed Codex Alera novels, best-selling author Jim Butcher has created a fascinating world in which the powerful forces of nature take physical form. For millennia, the people of Alera have used their unique bond with these elementals for protection. Now, as enemies become allies, and friends become bitter foes, a danger beyond reckoning looms. . . . I had to STOP everything! It is unfortunate that the first 2 books are so slow to get to this point but now the story can move and breathe on its own. What a full and wonderful adventure to listen to. Kate is still doing a superb job. This book is where the magic really happened for me in the series and book #5 is the same. 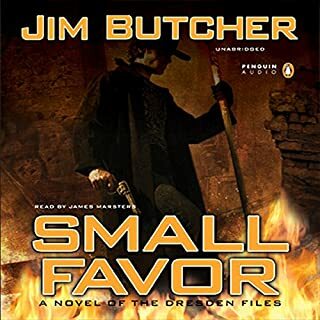 Great job Jim Butcher. The power-hungry High Lord of Kalare has launched a rebellion against the aging First Lord, Gaius Sextus, who with the loyal forces of Alera must fight beside the unlikeliest of allies - the equally contentious High Lord of Aquitaine. 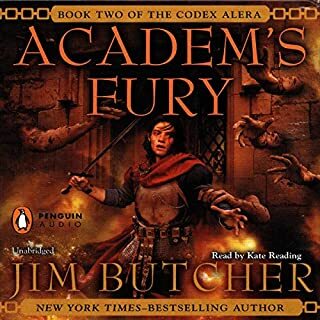 Meanwhile, young Tavi of Calderon joins a newly formed legion under an assumed name even as the ruthless Kalare unites with the Canim, bestial enemies of the realm whose vast numbers spell certain doom for Alera. As stated in my review of book #2, the story is getting better and better. Much easier to listen to get immersed in the people and the story. Good development of Tavi and Gaius Sextus. Still hate Issana. Keep going. 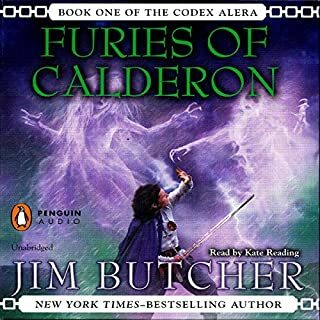 For 1,000 years, the people of Alera have united against the aggressive and threatening races that inhabit the world, using their unique bond with the Furies - elementals of earth, air, fire, water, and metal. But now, the unity of the Alerians hangs in precarious balance. If you read my review for the first book of this series, it was not too kind. However, the story has gotten better and has more teeth to it. Better development in story and style. Kate Reading is a good voice for this and can keep each person separate in her intonations and styles. Although I still do not like Issana, even though she is one of the good guys. She is just too much like a limp noodle that has drama. My opinion only, of course. I will give a spoiler alert in that I have now finished the whole series (Except #6 that just came out) and ended up loving the series. Stick with it, each one gets better through #5. Enjoy! 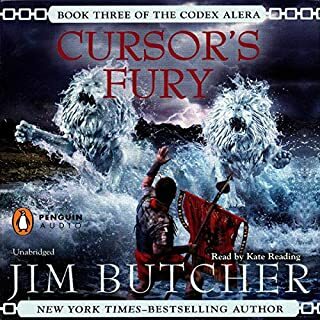 In the realm of Alera, where people bond with the furies - elementals of earth, air, fire, water, and metal - 15-year-old Tavi struggles with his lack of furycrafting. But when his homeland erupts in chaos - when rebels war with loyalists and furies clash with furies - Tavi's simple courage will turn the tides of war. Oh, how I HATE the horns!!!! I am a big Butcher fan and absolutely loved the Harry Dreden books. 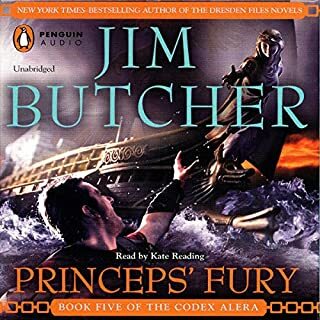 (See from book #8 and up for my reviews) This is indeed a different direction and the characters did not seem to have as much life to them as the Dresden books. It was slow to start with but did get a little better by the end. It was odd that "everyone" has these powers except Tavi and the Marrot. Isanna was wimpy and whiney. Story line seemed dated and there just wasn't enough of someone having great dialog and witty reparte'. It did not seem to make much sense that they use the "Furies" and some other sayings as both a blessing and a curse. Can't say I am a fan of this book. Might download one more as I am a Butcher fan but if it isn't any better, I'll save my next credits for something else. This series just keeps getting better and better. Harry has now developed a much fuller personal and professional life which is translated very well in the story. The plot line is fast moving, an easy listen and you are easily capable of keeping track of what is going on. I cannot even think of anyone except James Marsters of being the voice(s) of this series. His Toot-Toot impression is hilarious and actually makes me laugh out loud while driving in the car. I have missed turn offs on the freeway just being so engrossed in the story and the narration. Please start at the first book and work your way up to really appreciate the progression of the characters and the story lines. I have turned several friends on to this book series and they also are hooked now. Well worth it. Please write/release book 12 soon. Can't wait. Missing 2 minutes of audio! First, let me say that I was turned on to the hard copy books initially and loved the series from the start. Then I started travelling more for work and was nervous about having them in audio format starting with this book, #8. No need to worry, it was even better than I could have hoped for. James Marsters does a GREAT job of bringing the story and people to life. His intonations, laughs and accents really help to make this an exciting listen. I have actually found myself driving around the block of my customers locations a few times just to get to the end of a chapter for a stopping point. Just like a book you can't put down. I strongly suggest you start with the books in order, now that they are available, to help understand the story development fully. 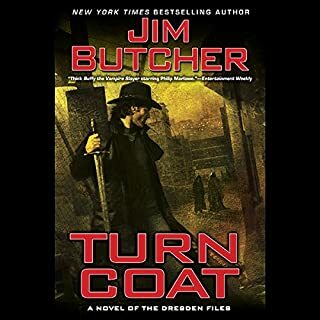 It is good to watch Harry Dresden grow from the beginning and know where the other players come in at and get the background foundation. I am now up to book #11 and they just keep getting better. I rate these books as 5 stars due to the story line and the excellent narration. Well done! I have to agree with another reviewer that says that he can now picture Dresden saying "FOZARE!". I am now the same way and also when Marsters makes the difference in using a small "fuego!" in comparison to belting out a bellowing basso "FUUEEEEGGGGOOO!!!!" It really brings the story to life and sometimes I get chills just from listening to it. This particular book was a great addition to the series. I really liked the ending and Captain Luccios part in it. I just downloaded # 11 and can't wait to get started on it.